Disposable — clean up is a breeze! 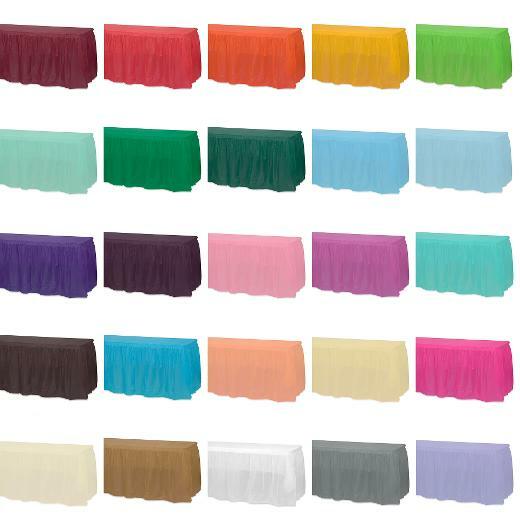 These plastic table skirts can add extra elegance to any table by wrapping around the edge and blocking the table legs from view. They're available in a wide variety of colors to match any theme and, thanks to our great prices, even buying wholesale table skirts in bulk won't put you over budget. Ideal for weddings, banquets and anniversaries! WE USED THIS COLOR SKIRT TOGETHER WITH BLACK TABLECLOTHES. IT REALLY ENHANCED THE TABLE AND THE WHOLE ROOM. THE QUALITY WAS PERFECT AND THE PRICE JUST RIGHT! THANK YOU!! I bought these green table skirts for the Scranton St. Patrick's Day Parade sign in. These skirts add a little touch of class, especially when you want to hide whats going on under the table! This color green is perfect!